In the 19 years that they’ve been making music, HIM have established themselves as a major international band, with frontman Ville Valo’s afflicted croonings on love and death attracting women in their droves. 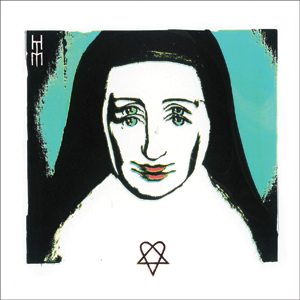 However, it seems that in a bid to propel their gothic tinged alt-rock further into popular conscious, on album seven HIM have sacrificed some of their individuality, favouring more commercial, Americanised rock over their darker Finnish roots. Given rumours that producer Andy Wallace was dropped from 05s ‘Dark Light’ on the grounds that he made them sound “too American”, having Matt Squire (Panic! At The Disco, 3OH!3) at the production helm results in tracks ‘Heartkiller’ and ‘In The Arms Of Rain’ sounding distinctly power-pop compared to the bite of 07s ‘Venus Doom’. ‘Screamworks…’ still channels the HIM spirit, allowing melancholy and compassion to creep in and out of the 13 tracks, but it’s familiar territory that’s been played out many times before. While metal-based ‘Scared To Death’ stands out, it doesn’t rival older songs like ‘Razorblade Kiss’. Still, this is a solid album, rife with brooding love metal and big choruses, but while this is HIM’s most accessible album to date it’s also the most unpalatable, as Ville takes one step too many towards self-satire.